Tot Time-Quack, Quack! What Does a Duck Eat? Adults and their tots will have fun exploring, discovering, and learning on the first Thursday of the month in the Museum’s Discovery Center. Spend quality time with your tot, while each of you makes new friends. A different topic and craft will be featured each month. 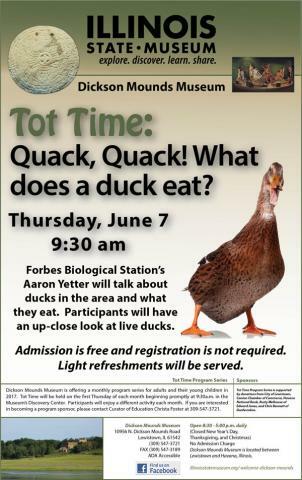 On June 7th, Forbes Biological Station's Aaron Yetter will talk about common ducks in the area and what they eat. Participants will have an up-close look at various male and female ducks. Registration is not required and admission is free. Participants will enjoy light refreshments. The program begins promptly at 9:30 a.m. with the program portion lasting approximately thirty minutes followed by crafts, snacks, and time to explore the Museum. Older siblings are welcome to participate in the program. This program series is sponsored by the City of Lewistown, Canton Chamber of Commerce, Havana National Bank, Lewistown VFW Post 5001 Auxiliary, Rusty Melhouse of Edward Jones, and Chris Bennett of Dunfermline.